The Union Environment Ministry notified a ‘Graded Response Action Plan’ against air pollution for Delhi and the National Capital Region. A Graded Response Action Plan (GRAP) is a set of stratified actions that are taken once the pollution level reaches a certain specified limit. The Supreme Court had mandated the Environmental Pollution Control Authority (EPCA) to come up with such a plan. Let’s take our minds back to the month of December in 2017, millions of people had their eyes glued on a televised cricket match between the national teams of India and Sri Lanka, hosted in New Delhi when an unforgettable scenario occurred. The match came to a halt, as it was noticed that a Sri Lankan player could barely breathe. He leaned forward, held his knees and began vomiting during a live broadcast, clear enough for the world to see. Obviously, the Sri Lankan cricketers weren’t ready for the polluted air Delhi had to offer, which at that time, exceeded twenty-two times the level of harmful pollutant particles that the World Health Organization considers acceptable. Without a doubt, it was a shameful moment that the Indian government wasn’t going to forget in a hurry. The city of Delhi is gradually becoming uninhabitable. Levels of polluting particles have been recorded at thirty times the level recommended by the World Health Organization. With over 20 million citizens exposed to all manner of deadly particles in the air, this is nothing but a crisis. In some areas of its territory, pollution has rocketed over the 451 points of microparticles, PM 2.5, according to the Air Quality Index scale. India is home to 14 of the 20 most polluted cities in the world and has recorded the highest rate of respiratory diseases. Unfortunately, children are the most vulnerable: a 2015 study concluded that about half of Delhi’s 4.4 million schoolchildren suffered from delayed lung development and would never fully recover. According to experts, the appalling air quality in the city implies that people, including the elderly, women and children, inhale the equivalent of 45 – 50 cigarettes a day without smoking a single stick. Worst of all, the environmental pollution could even get more critical at certain points in the year. Furthermore, that same study argued that, in 2015, India ranked first for the most deaths due to pollution. Statistics put forward revealed that 2.5 million people died prematurely due to pollution, which is equivalent to 28% of deaths due to pollution worldwide. Although the dust and sand clouds were blamed for the immediate increase in pollution levels, the sight of the dense smog that envelops Delhi months before winter has underlined a growing awareness that harmful air is a problem throughout the year for the city. Air quality in the Indian capital worsens annually before each winter as farmers in the neighboring states of Punjab and Haryana burn the remains of the crops in October and November to prepare for the next growing season. Emissions from vehicles and industries, construction dust and the burning of waste are also among the causes of high levels of pollution. 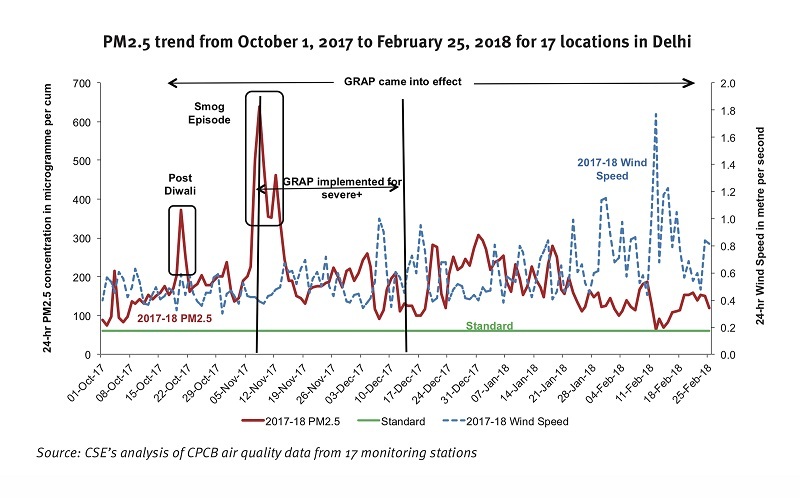 By October, the quality of air in Delhi generally begins to collapse, due to the trapping of pollutants closer to the ground by slower winds and cooler temperatures. However, according to data published by the government’s Central Pollution Control Board, air quality has been classified as “very unhealthy”, with index scores of up to 270, during the months of April and May, since the authorities began collecting and publishing the statistics. In over three years, it was only in one day in April or May that the air was classified as “good”, which saw the index score drop to 99. According to an independent researcher who studies air quality in India, Aishwarya Sudhir, “This clearly shows that this is also a summer problem”. Meteorologists have also stated that the presence of a layer of dust throughout the city is also catching the heat, sending temperatures above 40ºC. 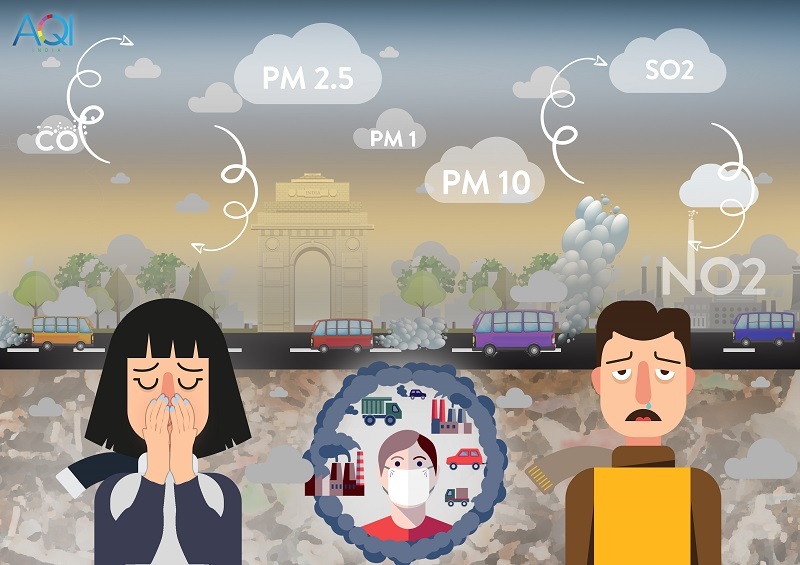 According to the government website that monitors air quality, in New Delhi, the levels of suspended particles are less than 2.5 micrometers, a size so small that it can penetrate the lung tissue and damage it. This public health crisis is a dent on the image that India wants to portray to the international community. It is a drag on her economy, and, according to a new UNICEF report, it could be permanently damaging the brains of children. Environmentalists in the country admit that air pollution is an issue with many causes, not forgetting that they have blamed the government for failing to properly respond to this deadly issue that is endangering the lives of her citizens. At the beginning of November 2017, the smog in New Delhi was so dense that you couldn’t see the end of a street. United Airlines canceled flights for several days and authorities closed schools. People filled the hospitals with severe cases of a cough. The million dollar question is: Why can’t India, a country that has made considerable progress in the fight against poverty and aspires to be a superpower, control its pollution? What is GRAP all about? When we talk about a Graded Response Action Plan, we refer to a set of stratified actions that are triggered in response to specific pollution levels. It is referred to as a ‘graded’ plan, due to the fact that program functions in a step by step manner, or in stages. There are specific actions to be taken for certain pollution concentration levels. Thus, bringing about a gradual form of pollution control. It is important to understand that this pollution control is not just the job of one department, but a coordinated mission, executed by several departments. This plan prevents the authorities from responding to this health threat in an entirely strict manner, one that would inconvenience the populace, but rather tackle the situation gradually. Within the plan, there are several specified limits. These limits deal with air pollution levels or, to be more specific, the concentration of particulate matter (PM). At any point in time, if the authorities identify that the concentration has reached or exceeded a certain level, proper actions to checkmate or control the pollution, which is specific to that level, will be taken immediately. For instance, let’s say the particulate matter is measured at 100 micrograms per cubic meter, actions such as mechanized cleaning of roads, sprinkling of water etc, which have been set aside for a pollution at that level, will begin, as a means to control the pollution. In instances where the concentration of particulate matter reaches higher and more dangerous levels, the government can impose tough regulations like banning the use of firecrackers, generators, prohibition of construction activities in certain areas, and even closing of schools. 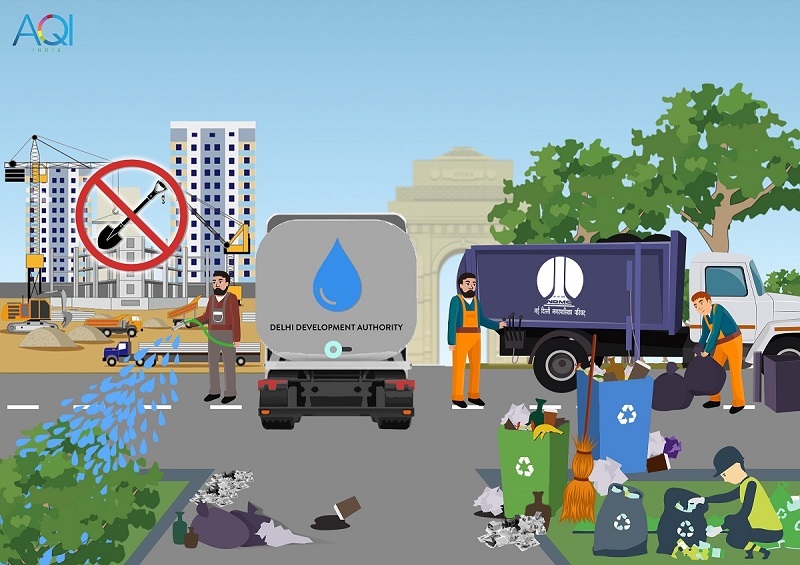 We can look back to November 2017, when the authorities of New Delhi, took strict measures in the GRAP, by ordering the closure of schools, the suspension of construction works and prohibiting the entry of trucks into the city, due to the calamitous levels of pollution registered during that period in the city. The thick and toxic gray smoke that filled the city, raising the level of pollution to “more severe”, led the local government to approve the decision of the Environmental Pollution Prevention and Control Authority to adopt a series of measures to relieve the situation. In a meeting attended by Prime Minister Arvind Kejriwal and Lieutenant Governor Anil Baijal, the environmental authorities proposed the implementation of the Action Plan, stating the necessity to take measures that are listed in the most severe category. City authorities rushed to face the extraordinary situation as hospitals recorded an increase in the number of patients complaining of respiratory problems, reminiscent of the ‘Great Smog of London in 1952’. The average air quality index throughout the day had a score of 478 on a scale of 500, indicating severe levels of contamination. The Environmental Pollution Control Authority (EPCA), assisted by the task force, is saddled with the task of identifying the particulate matter levels in each and every state. Proper analysis is then done to ascertain the concentration levels. If or when it is confirmed that specified limits have been reached, the EPCA dishes out orders to relevant departments, which may include the likes of transport, public works etc, to begin working to control the pollution. In advance, these relevant departments are briefed and given various tasks to perform for each level of pollution. These tasks are to be carried out upon notification in a bid to bring the pollution level down at an early stage.